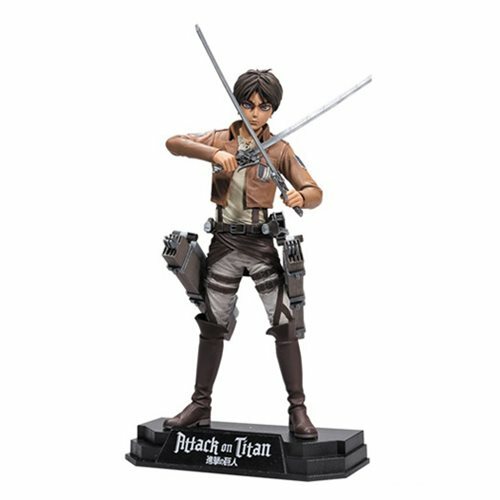 Shopping for Attack on Titan Action Figures? Revenge on the Titans! Swearing revenge on the Titans for destroying his home and devouring his mother, teenage boy Eren Jaeger joins an elite group of soldiers, known as the Scout Regiment to help combat the Titans and take back his world. Eren's drive makes him impulsive, hardheaded, but passionate to protect humanity and free them from the fear of the Titans. The Attack on Titan Eren Jaeger 7-Inch Action Figure comes with removable cloak, three dimensional maneuver gear, and duel blades. Sculpted in his iconic Scout Regiment uniform, the popular anime is translated into spectacular 3D reality! Ages 12 and up.